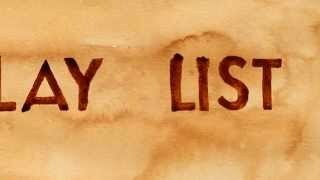 Coffee Art | Letterman Coffee Animation David Letterman loves his coffee! 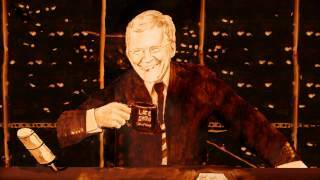 In honor of his retirement from The Late Show, the Coffee Artists created an animation from a coffee portrait they created for him. Coffee Art | Coffee Run The Coffee Artists created this "Coffee Run" painting during the filming of their Minnesota Original segment. 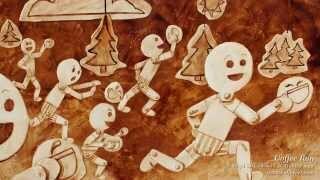 This painting then evolved into this animation. 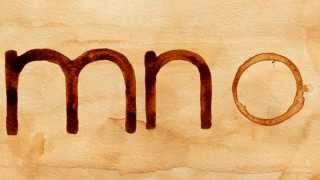 Coffee Art | Minnesota Original Painting This is a Coffee Art® animation of the Minnesota Original logo. Coffee Art | Playlist The Coffee Artists make an appearance on The Playlist. 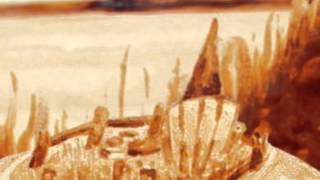 This coffee painting of the show's logo was created as an animation. 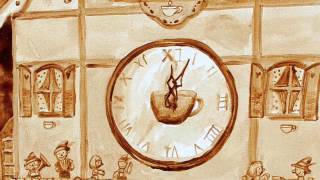 Coffee Art® | Coffee Time This Coffee Art® painting it titled 'Coffee Time' by Angel Sarkela-Saur. Visit the coffeeart.com website to view more fine works of art created out of pure coffee. Coffee Art® | And a Smile This Coffee Art® painting it titled 'And a Smile' by Angel Sarkela-Saur. 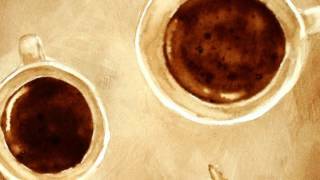 Visit the coffeeart.com website to view more fine works of art created out of pure coffee. 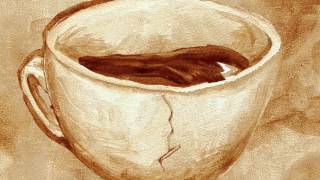 Coffee Art® | Bottomless Cup of Coffee This Coffee Art® painting it titled 'Bottomless Cup of Coffee' by Angel Sarkela-Saur. Visit the coffeeart.com website to view more fine works of art created out of pure coffee. 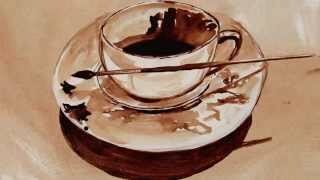 Coffee Art® | Coffee Break This Coffee Art® painting it titled 'Coffee Break' by Angel Sarkela-Saur. Visit the coffeeart.com website to view more fine works of art created out of pure coffee. 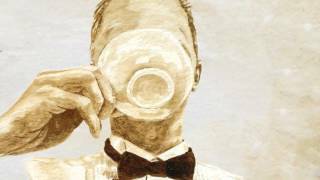 Coffee Art® | Coffee Connoisseur This Coffee Art® painting it titled 'Coffee Connoisseur' by Angel Sarkela-Saur. Visit the coffeeart.com website to view more fine works of art created out of pure coffee. Coffee Art® | Coffee Gnome Home This Coffee Art® painting it titled 'Coffee Gnome Home' by Angel Sarkela-Saur. Visit the coffeeart.com website to view more fine works of art created out of pure coffee. 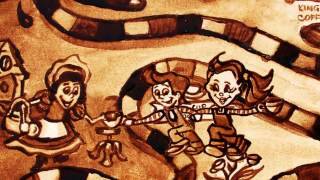 Coffee Art® | Coffee Land This Coffee Art® painting it titled 'Coffee Land' by Angel Sarkela-Saur. Visit the coffeeart.com website to view more fine works of art created out of pure coffee. Coffee Art® | Coffee Palette This Coffee Art® painting it titled 'Coffee Palette' by Angel Sarkela-Saur. Visit the coffeeart.com website to view more fine works of art created out of pure coffee. 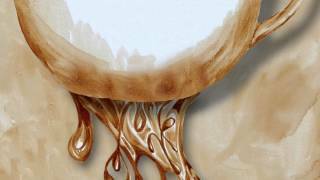 Coffee Art® | Embellishment This Coffee Art® painting it titled 'Embellishment' by Angel Sarkela-Saur. Visit the coffeeart.com website to view more fine works of art created out of pure coffee. Coffee Art® | Roasting This Coffee Art® painting it titled 'Roasting' by Angel Sarkela-Saur. Visit the coffeeart.com website to view more fine works of art created out of pure coffee.